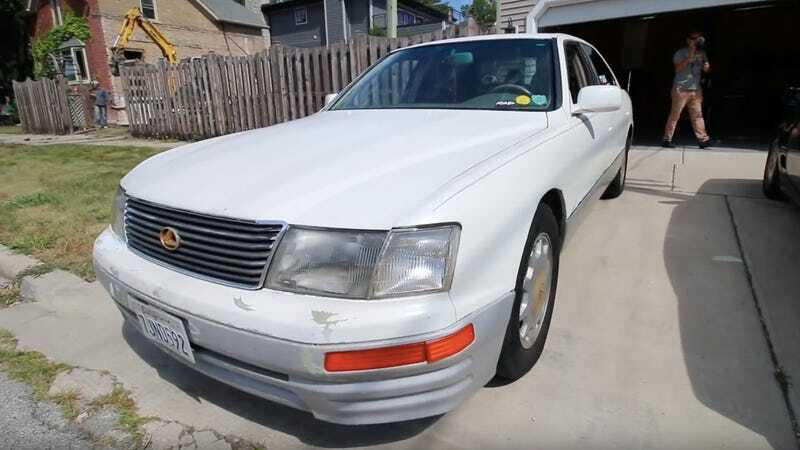 The “Million Mile Lexus” that’s been floating around the internet for a few years now is actually getting close to its namesake. It’s still running, but this closer inspection of the undercarriage reveals its true jankiness. The Lexus LS sedan is owned by The Smoking Tire’s Matt Farah, who bought it on a lark with about 900,000 on its odometer and has been lending it out to people to expedite the car’s journey to seven digits. It’s currently in the care of of adventurers Ana and Anton, who are taking the car on a lap of America. In Chicago, yet another YouTuber Alex Palmeri caught up with the car, raised it up on a lift, and gave us a little tour of what the Lexus’ current condition really is. If you want to skip straight to the inspection, it’s at around the 9-minute mark in the video. Basically, like any mileage-car, a lot of the small-but-essential soft bits in the undercarriage are smoked. Bushings around the differential and control arms have a lot of play, some wheel bearings look used up, and oh yeah, the car’s leaking from pretty much every internally lubricated component. Once an OBD scanner is hooked up, the car’s computer reveals a few more gremlins. On the road, that translates to vibration and eventually weird wear on other parts. Palmeri basically deems the car basically roadworthy, pretty much, maybe just because he doesn’t want to dash Anton’s dreams completely, but the car needs a lot of work.